I am just looking back at Nigeria’s World Cup participation and I can never forget our first appearance in 1994, a green team but with the potentials of going all the way until something happened to us, yes, Clemens Westerhof. 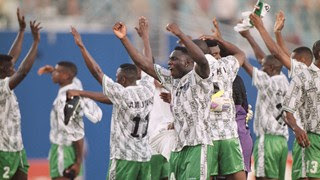 Till date Nigerians who watch the Super Eagles claim the USA 94 team is the best ever to have graced the Mundial and they may not be wrong, but was it inexperience on the part of the players or the coaches that stopped the team from going all the way? I started following the Nigerian team’s World Cup Qualifying campaigns in 1983 when the race for the Mexico 86 event started but I had read about the others and they were not just spell binding, they were for the top drawer of the suspense scripts. In the 1978 race, Nigeria started with a 6-2 aggregate win over Sierra Leone in the 1st round, and in the 2nd round walked over Zaire. In the 3rd round, Nigeria beat the Ivory Coast 6-2 on aggregate and it seemed we were almost there; just one round left and three teams lumped in a group. Nigeria, Egypt and Tunisia would be in the group and the top team after round robin home and away fixtures would qualify for the World Cup. 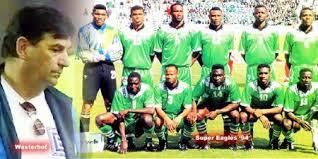 That team had the likes of Adokiye Amiesimaka, Segun Odegbami, Christian Chukwu etc. We had a favorable result against Tunisia (we dreaded the North Africans then) drawing 0-0 in Tunis and then we beat Egypt 4-0 in Lagos. A 3-1 loss to Egypt in Cairo did not dampen our spirits much because we just needed a draw against Tunisia in Lagos to top the group and were close to doing it before Godwin Odiye, one of the finest center backs of that era, put the ball behind his own goalkeeper. That dream was over. In 1981, as the team were on the way to qualifying for the World Cup in Spain and after getting to the last stage of qualifiers against Algeria, someone decided to recall players who retired from international football since after the African Cup of Nations (AFCON) win in 1980. The likes of Christian Chukwu, Tunde Bamidele etc returned to the team and after ninety minutes in Lagos Nigeria lost by 2-0. Another World Cup dream was over. I watched the race to Mexico 86 as a teenager in secondary school and that team seemed set to qualify for the World Cup until 5 players were banned from the team by the Nigeria Football Association for acts of indiscipline. These were like 5 of the best. 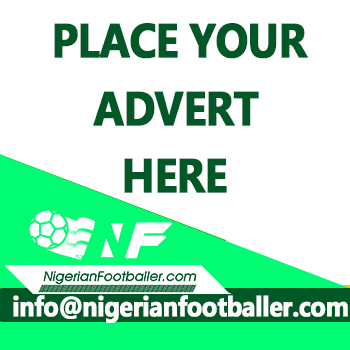 Stephen Keshi, Sunday Eboigbe, Bright Omokaro, Henry Nwosu and Clement Temile were given one year bans from football and things started to crumble. To put this into proper perspective, imagine the Nigeria Football Federation banning John Mikel Obi, Victor Moses, Leon Balogun, Odion Ighalo and Wilfred Ndidi… yeah that was similar to what happened in 1985. By the time the Eagles were to play Tunisia in a two legged encounter, it was a struggle before Okey Isima got a late goal for a slim 1-0 win in the first leg. Nigeria lost the return leg 2-0 and another dream was over. In 1990, Cameroon ended our dreams and when Clemens Westerhof qualified the Super Eagles for the World Cup in USA, it was massive for us all. The team had the finest collection of Nigerian players but we went there with caution. 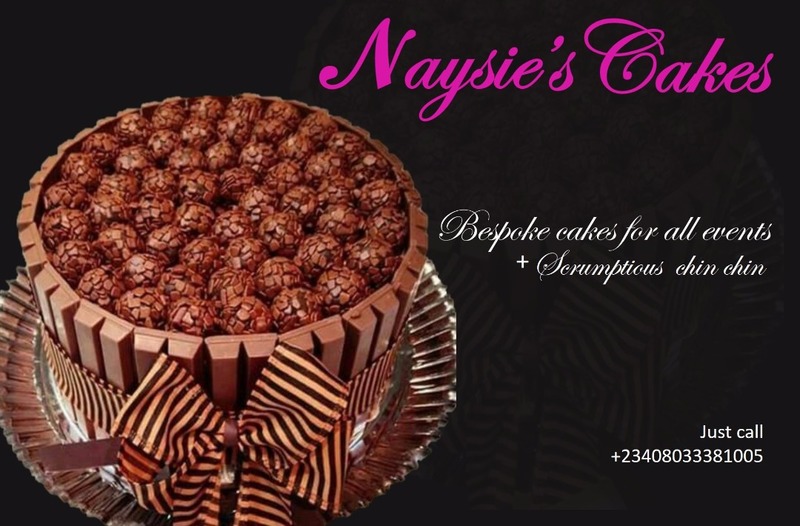 In the World Cup year, we had won the AFCON in style and it seemed there was no stopping us. We were grouped with Bulgaria, Greece and Argentina at a time when even the 3rd placed team could qualify and we figured that we just needed to win one game and not lose the others scandalously to make it to the 2nd round. For me, a 2nd round placing was all that mattered. Our team at that time was brewing with more confidence than the fans had and it was evident in the way they played. Peter Rufai, was at the top of his game and was one goalkeeper we could all look up to if the team had to be saved in an instant. Personally, I thought Wilfred Agbonivbare was better. He had done well in the qualifiers against Algeria and the Ivory Coast in the absence of Rufai and Alloy Agu who was 1st choice at the AFCON in 1990 and 1992. We thought we had a rock solid and confident defence of Austin Eguavoen, Uche Okafor, Uche Okechukwu and Benedict Iroha when we played at the AFCON early in the year, but when Chidi Nwanu joined up for the World Cup, what Nigerians saw was arguably the best defensive quartet ever, for the Super Eagles. In midfield was where the team’s engine was clearly visible. Sunday Oliseh, though green and discovered for the national team a year earlier had clearly sequestered his place there. His long range passing was sublime, his marking was top notch and he was young so very mobile. Finidi George who went past opponents on the right side of midfield with arrogant ease and Emmanuel Amuneke on the left side. This was a team of men. Samson Siasia, Daniel Amokachi and Rashidi Yekini in attack would trouble any defence in the World. 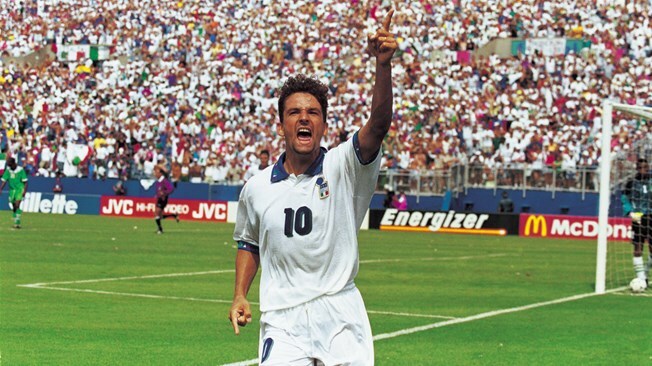 The Italians had a poor World Cup run so far and their talisman, Roberto Baggio was injured and playing regardless. The Super Eagles had a team we believed could beat the Italians and when Amuneke scored first in the 27th minute, it was “obvious” we could win. 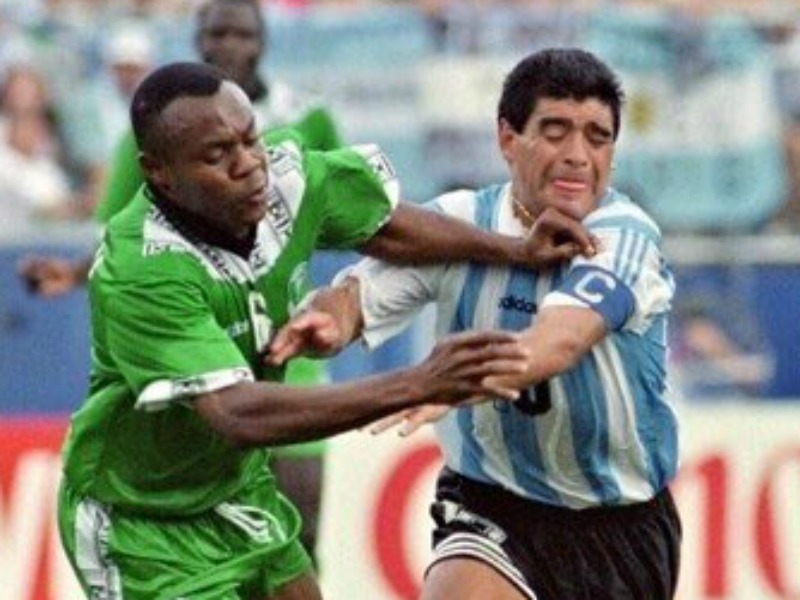 Nigeria was in complete control of the game but suddenly, Emmanuel Amuneke was taken off injured in the 35th minute and Daniel Amokachi later on in the game. That was when Clemens Westerhof killed us. The Super Eagles at that time had a team loaded to the hilt so injuries to Amuneke and Amokachi shouldn’t have bothered us much, right? But the naiveté of Clemens Westerhof, or so I thought, showed here. The injured players had scored 2 goals each at the World Cup, the Italians were under so much pressure and would have caved in, so I thought, “Bring on Samson Siasia. He is a decent goal scorer, and even got one against Argentina. His ball handling is top notch. I thought, even bring in Efan Ekoku who had done the business at Norwich City, or maybe Victor Ikpeba who had scored loads of goals at Monaco” but no, Clemens Westerhof thought to bring on Mutiu Adepoju and then, Thompson Oliha. Alessandro Costacurta and Paulo Maldini had completely rendered Rashidi Yekini ineffective, but maybe, the coach thought there would be that moment of magic which did not come. Austin Okocha was busy doing what he knew best, dribbling without direction and it surely was not helping the team. We had lost our attacking edge, the Italians had come back into the game and the pressure was on us. Sunday Oliseh wasn’t assertive when he kicked that ball into a throw in and the rest, as they say is now history. 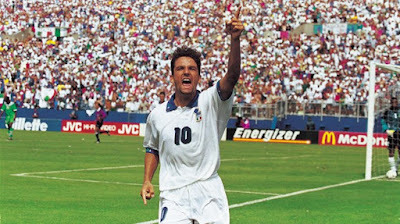 Roberto Baggio equalized and went on to score the winner via a penalty after Austin Eguavoen (oh my God) conceded that penalty even after the Italians had gone one man down through that Gianfranco Zola’s red card. I was distraught. How could we have lost a game we were primed to win? What happened there? Did the players sabotage the team? Why did Eguavoen foul the Italian player for that penalty? Why? Why did Clemens Westerhof not make the right substitutions? Why did he deviate from his normal starting front three of Samson Siasia, Daniel Amokachi and Rashidi Yekini? Why was Austin Okocha dribbling all over the place, like he was playing “choosing” when we had a serious World Cup match to win? Why? Why?? Why??? Why wasn’t a red card shown to Paulo Maldini for pulling down a goal bound Rashidi Yekini? I asked a lot of questions that night as I stepped out of the house, completely dazed and out of my mind. I did not know where I was going, just walking away, trying to get the sad loss off my mind. If I was a drinker, that would have been the best night to get drunk and wasted. If I smoked, be my guest, I would have had a field day, but I just continued walking as far away from the house as possible. I don’t remember how far I walked but about three hours later, I was back home and I completely shut the memories of that game from my mind. I never re-watched it, I never discussed it and as far as I was concerned, that game did not exist for me. I disliked Clemens Westerhof and I disliked Austin Eguavoen. I also disliked Sunday Oliseh and Austin Okocha. These were the villains that ensured Nigeria lost out to Italy, a team they could have beaten easily. Heck, I disliked that referee and FIFA. I disliked everyone. It was me against the World. I never saw that game again or its highlight until Brazil 2014, when I was watching World Cup history on Cable TV and it got to 1994 and that loss to Italy. I did not turn my face away but stayed back to watch, fighting the tears I did not shed in 1994. Last week I discussed that game for the first time since 1994 with three friends, first, Ikenwa Nnabuogor and he was still very bitter, twenty four years later; Sanipe Damiete and Ufuoma Egbamuno, all still feeling bad over that loss. Twenty four years ago, I thought the Super Eagles would have reached the World Cup final and lost to Brazil, not because the Brazilian team in 1994 were clearly better, but because they had their name written on the World Cup, but Clemens Westerhof happened to us. 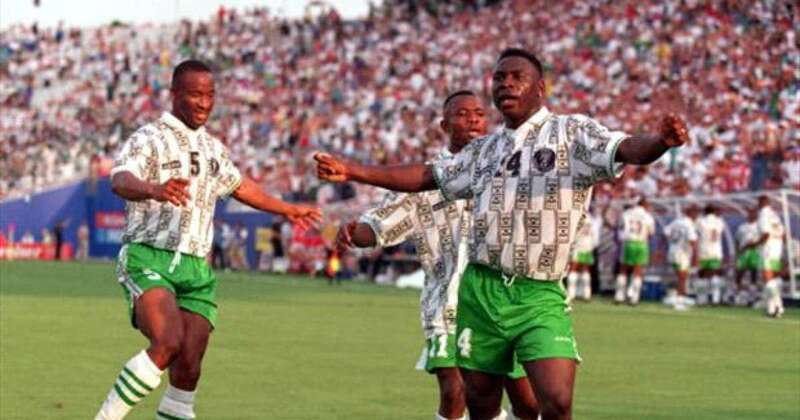 In 2018, I still believe that the Eagles would have reached the final of that World Cup in 1994. Had we beaten Italy, our next round opponent would have been Spain, who in 1994 were the shame of the World Cup and couldn’t win anything to save their lives. We would have dispatched them easily and then met Bulgaria in the semifinal. Remember, we beat the Bulgarians 3-0 in the group stage. Clemens Westerhof killed my World Cup dream in 1994 and for all what he did for Nigerian football I do not like him very much. I need to see him and ask him to explain to me why he did not start Samson Siasia in that game and why he didn’t throw in Victor Ikpeba, Efan Ekoku or even Emeka Ezeugo to shore up the defence line later on. Have I moved on from that loss in 1994? How can I? I will never!